Please note: All orders must be prepaid by April 1, 2019 to guarantee selection! Complete your order below. Once you have checked out, you will be redirected to a new page. On this page, please select the site where you will pick up your trees -- either the Lucas SWCD office (Maumee) or the Clay High School Ag Vocational Center (Oregon). Delivery is NOT an option -- All orders must be picked up at one of these sites on April 11 or April 12. NOTE: Lucas SWCD charges no sales tax, but all online orders have a 3% fee to cover our web costs. ​A large, graceful tree with dark green foliage and heavy spreading branches. Needles are short, ½-1 inch. Growth rate of moderate to fast reaching 35 feet in 20 years. Has large cones. Grows well in most soils and drainage conditions, but prefers sandy soil. Height 40-60 feet and 25-30 feet in spread. Also known as a White Fir. Grows to 100 feet and is one of the most beautiful and easy to care for evergreens. Ashy gray trunk with very soft silvery blue foliage. One of the best Christmas trees. Holds needles best of any short-needled evergreen. flattened needles and branchlets. Can be used for hedges, wildlife habitat, windbreak. Grows well in a wide range of soils and drainage conditions. Height 18 - 20 feet, spread 8 - 10 feet. pleasant cedar-like aroma. Soft, lustrous green foliage and central leader sheds snow well. Can tolerate drought and most soil conditions. Grows up to 3 feet a year, to 6-10 ft. wide by 25 ft tall. True American Elm resistant to Dutch Elm Disease. Extremely fast-growing native, 3-6 feet per year. Classic vase shape, gorgeous yellow fall color. Thrives in almost any soil condition. Grows up to 60 feet tall by 40 feet wide. Long lived, up to 80 years. An Ohio native member of the magnolia family. Tall, fast-growing, deciduous tree reaches 25-30 feet in 10-12 years. Large tulip-like flowers in spring.Broad showy leaves turn bright yellow in fall. Great shade tree, 90+ feet high by 20-35 feet wide. Grows up to 2 feet a year and will produce acorns in 10-15 years. Leaves are dark green in summer, a russet red in autumn and "hang on." Tolerant of many urban conditions. Ice and wind resistant. Up to 60 feet tall by 50 feet wide. *NEW! River Birch "City Slicker"
This borer-resistant river birch develops showy white paper bark, with glossy dark green leaves that turn gold in fall. Can grow 2 to 3 feet per year, drought-tolerant and adaptable to a wide range of soils. Also known as Juneberry. Edible berries are a good substitute for blueberries in alkaline soils. Can be grown as a small tree or a large suckering shrub with white spring flowers followed by purple-blue fruit in summer. Mature height 15 to 20 feet. Large banana-like fruits with the famous vanilla custard taste. Large leaves with outstanding fall color. Show purple-red flowers in spring. Grows in almost any soil and withstands swampy conditions. Grows to 25 feet high by 15 ft wide. Medium to large bottomland oak in the white oak family. Sweet acorns for wildlife, gray bark has flaky ridges, leaves turn dark red in the fall. Wood prized for lumber and making baskets. Prefers moist soils. Grows 40 to 60 feet high with similar spread. Also called Blue Beech, Ironwood and American Hornbeam, this native understory tree has attractive mature bark, mature fruits and nice fall foliage colors. Very adaptable to many soils, grows to 30 feet tall and 20 feet wide. Small, mound-shaped native shrub with small pinkish-white flowers and bright coral-red to purplish berries that last through the winter for birds. Adaptable to most soils, does well in shade. 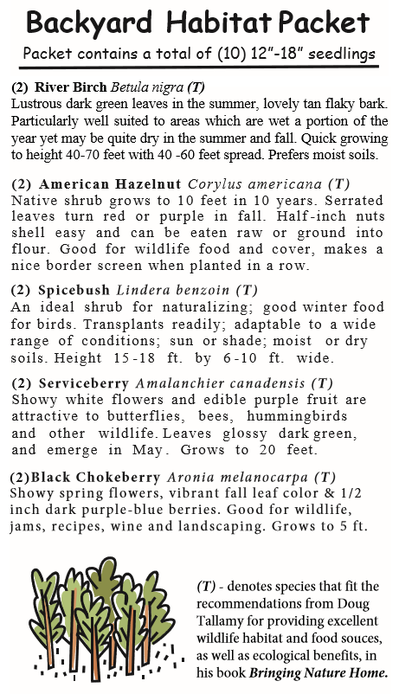 Low maintenance and deer-resistant, grows 4 to 6 feet high. A showy native shrub with bright red stems, white summer flowers, clusters of small white berries, bright fall foliage and attractive winter bark. 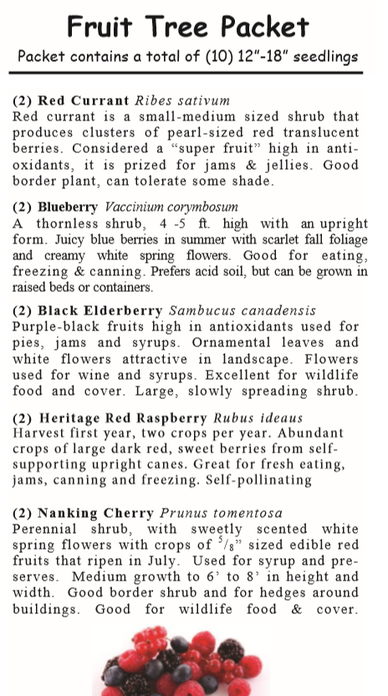 Excellent nectar and wildlife benefits. Grows 5 to 15 feet by similar width. Fast-growing, adaptable to most soils. Makes a good hedge or windbreak.